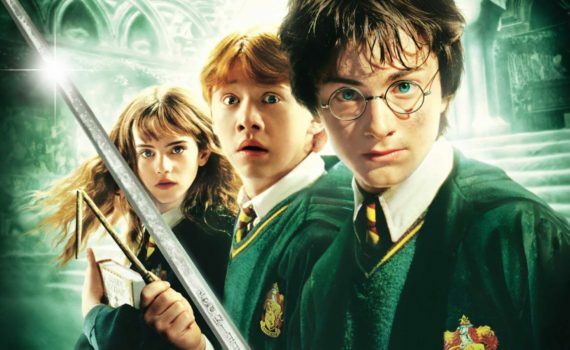 The second installment in the Harry Potter movie franchise is Chamber of Secrets, which was a book that followed the successful steps of the original fairly closely, and which is a film that does that same. If it’s not broke, don’t fix it, I guess, and there was definitely nothing broken about the first story in this franchise. J.K. Rowling worked a bit of magic, the movie held up its end of the bargain, and everyone went home happy. So #2 follows the same path and can’t be blamed for doing so, while also stepping up the action just a touch and leading audiences toward what will ultimately be a pretty bloody battle for the supremacy of the wizarding world. Harry is back at school after having survived an assassination attempt and final term exams. He hates being back with his relatives during the summer, but luckily his friend Ron is there to break him out of jail, as it were. The pair are off to Hogwarts in a flying car, but something or someone is trying to stop Harry from reaching his destination, and is trying to force him out once he’s there. At the same time, a danger is growing in the school, a secret chamber has been opened and a monster has been released, a creature that seems to be seeking out Muggle-born children. Harry will have to unravel the mystery of his own conundrum and save Hogwarts; all in a year’s work for a hero like Potter. This movie flows very similarly to Sorcerer’s Stone, which is fine, since the first is so delightful. The same characters are back, with the addition of more Weasleys, more Malfoys, and a hilariously inept teacher played by Kenneth Branagh. I’m a sucker for the revolving Defense Against the Dark Arts door, and this film keeps that joke alive in a major way, so I was happy. What I was unhappy about, though, was Ron. Grint’s acting in this film is atrocious, and it’s only made worse by his cracking, pubescent voice and strange man/child demeanor. He’s in an awkward phase, I understand that, but his character suffers because of it, and then so does the movie. Otherwise, still entertaining for mostly everyone and another solid piece to the HP puzzle.